Bachelor of Arts: Psychology May 2015 Hillsdale College - Hillsdale, MI Double major in Spanish and Early Childhood Education. Student Scholar Athlete, Four year GLIAC All-Academic Team. Excellent time management skills. Balance a 40 hour practice, training, competition, and travel schedule, in addition to rigorous Hillsdale College academics. Extremely coachable, learned to manage different coaching styles and appropriately respect and cooperate with authority figures. Learned how to effectively and productively handle team conflict and confidently confront people when necessary. Provided direct therapeutic interventions to autistic children ages 5-18, by teaching, modeling, and coaching of ABA techniques directed to increase language and communication skills, social skills, appropriate play skills, cooperation skills, and daily living skills, and accurately evaluated and recorded detailed reports of patients' progress. Created promotional flyers and media posts about book-buying service and then acted as sole buyer for the school and met with numerous clients to purchase their used textbooks. Handled the bank account provided by the company to withdraw and deposit money in order to complete book transactions. Collected all books and deposited them to the company storage facility. Bill clients through the company database, audit monthly reports submitted, and file paperwork for all First Steps therapists in Central Indiana. 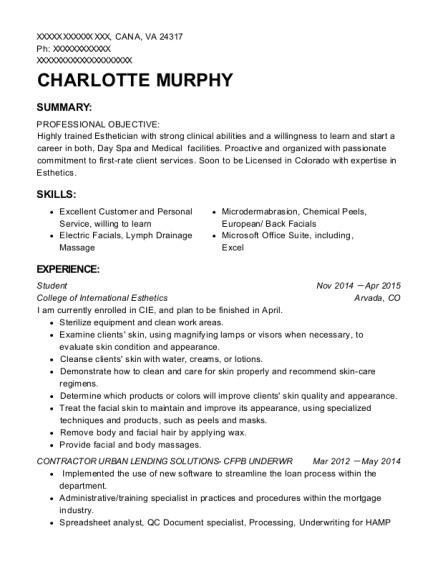 Follow-up phone calls for customer relations and questionnaire processing. Helped developmentally delayed and at-risk children ages 4-18 by shadowing therapists and assisting in the client's verbal, behavioral, and social development. Strong organizational skills. Can handle details, coordinate tasks, manage projects effectively, and multi-task in a punctual manner. 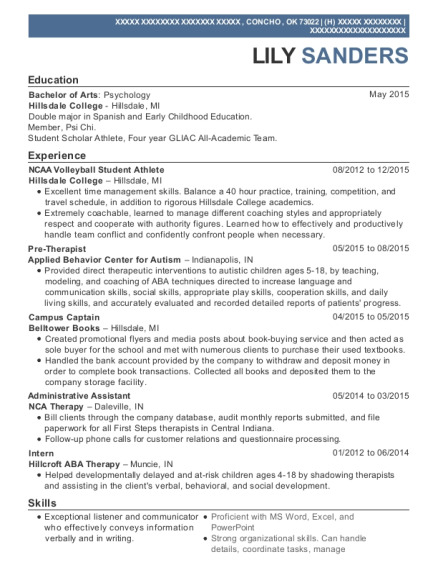 This is a resume for a NCAA Volleyball Student Athlete in CONCHO, Oklahoma with experience working for such companies as Hillsdale College and Applied Behavior Center for Autism. 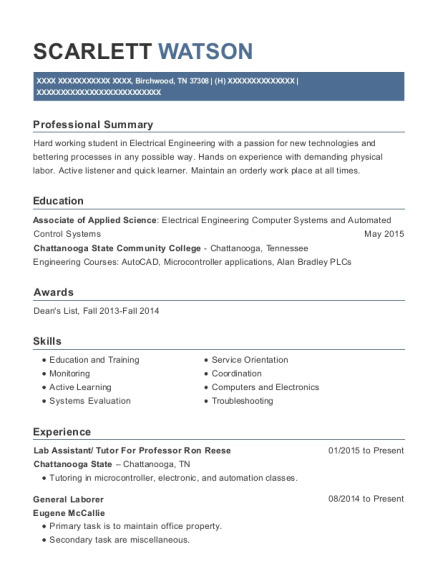 The grade for this resume is 0 and is one of hundreds of NCAA Volleyball Student Athlete resumes available on our site for free. 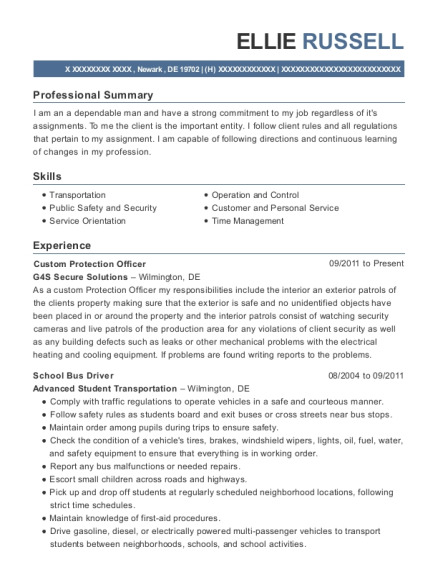 Use these resumes as templates to get help creating the best NCAA Volleyball Student Athlete resume.